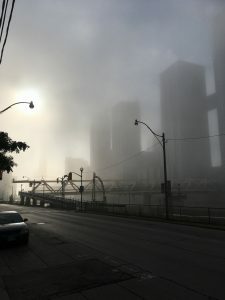 It’s going to be another hot and humid day here in Toronto, and with it comes the risk of thunderstorms this afternoon. If the skies do open up, we’ll scramble for cover to stay dry (and to avoid being struck by lightning). I love summer. I’m just not one for the heat. It’s the humidity that I have a difficult time dealing with, actually. It drains my energy, leaves me feeling lethargic, somewhat foggy, and unmotivated. I don’t feel like doing anything. That’s when I realize I have to just hold on. For me, life as a writer has a lot to do with “just holding on.” On the days when I write — whether I’m starting a new novel or short story, or rewriting or editing a manuscript — and the work feels uphill, I encourage myself to just hold on. I remind myself that I’ve made it through difficult periods before. I practice patience (or I try). Giving myself over to the work, I edge forward one word at a time. I try not to worry about how “bad” the writing may seem because I can always come back to it later, polish it, make it sing. The challenge? I can’t let myself get caught up in frustration. If I’m feeling too bogged down because the writing isn’t moving forward as fast as I’d like, I take a break. I go for a run, make a trip to my favourite coffee shop, or whip up something sweet and delicious in the kitchen. If I do that, then I usually come back refreshed and can see the writing from a new perspective. Just hold on is, perhaps, another way of saying, “Take the long view.” A career in the arts doesn’t, for a lot of artists, happen overnight. We show up at the page, the easel, the piano, day after day honing our skills and building our repertoire. We fly through seasons of abundance where all our projects take flight. We stagger through the seasons of drought when projects stall, and our confidence may take a knock. But, always, we show up daily to practice our art because we believe in our dreams. We continue to just hold on. Let us go forth together and do what it is that we love to do. Let us hold fast to dreams, to who we dare to be. And when, as the saying goes, the going gets tough, remember to just hold on. How is your creative/life journey moving along? 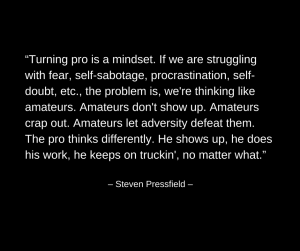 When you feel stalled, how do you get yourself moving again? Let me know in the comments section below. Waking up at 4:00 a.m. this morning (18 July 2017) and then sitting down at my desk to write, I relish that moment of quietude. It’s that one time of day — as most people in the city are still asleep and the busyness of the morning commute has yet to commandeer the streets — when I can actually hear myself think. It instils a calm, allows me to feel hopeful about the day ahead. I try not to think too hard about the ambitious agenda I’ve set out for myself. Otherwise, I’ll end up feeling overwhelmed, which will send me spinning, and my plans for the day will quickly be derailed. I don’t want that to happen. 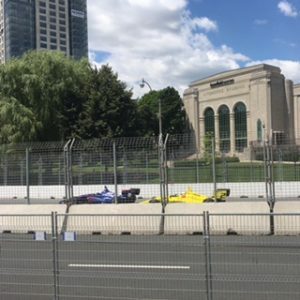 Took a little time out on Sunday to check out the Honda Indy Toronto on Sunday, 16 July 2017. Why? Because it’s difficult to escape today’s “go-go-go” mindset. It’s easy to believe that to succeed I need to act like the Energizer Bunny, and that I must keep going and going and going. Guess what? Between the demands of my day job and the ruthless pursuit of my writing dream, I’ve discovered (and it’s a real shocker) that I’m not the Energizer Bunny. I’m human, and my body needs to rest. And if I don’t let myself recharge, my body will tell me to slow down by way of a cold or some other ailment. This won’t surprise you. I am forever learning the art of work and play. Life is rich with all its beauty and with so many things to discover. Writing is very important to me, to my life, and each day I write I am inching closer to realizing my dreams. But life isn’t, and shouldn’t be, all about writing. When I open myself up to other experiences, when I let myself do other activities, I am gathering material for my creative stores. Like this morning, running along the lakeshore at sunrise. 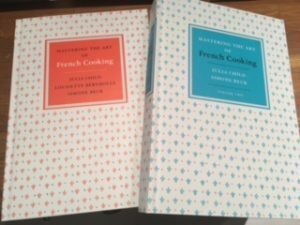 Or flipping through Child, Bertholle and Beck’s Mastering the Art of French Cooking for something creative to make for dinner tonight. Continuing my journey through Tom Clancy’s novels. Small, simple pleasures. So there are days when I simply need to rest, when I need to let myself do nothing. Here’s the problem: It’s hard to let myself rest (like today) when I find myself often looking to the future and where I hope to be. But if I try to keep working when I’m exhausted (or more aptly, burnt out), the work, or more precisely my writing, won’t hold up later on. It’ll be tired, stiff, lifeless. Then I end up procrastinating and fretting over my inability to work. The funny thing is this: When I take time to rest, to let my body and mind recharge, I’m able to come back and tackle my artistic projects with vigour, see their worth (or lack thereof) from a new perspective. Once again, there is a natural ebb and flow. It is still, for me, a question of balance. Do you have regular hours for work and play? How do you recharge your body and mind? Let me know in the comments section below. This blog post is inspired by the Word Press Daily Prompt: Savor. Getting up is easy. Getting to work can be hard. Walking or running for me brings clarity, burns through the fog. I’m a light sleeper, waking up multiple times throughout the night. At some point (and this happens every night), my back starts to hurt. That’s when I know it’s time to get up, and that’s usually between 4:00 and 5:00 a.m. Exhausted from a couple days of travel, this morning was no different. There was that dull ache in my back. I rolled onto my side, my eyes sidled the clock on the nightstand (4:11 a.m.), and it was time. I pushed back the counterpane and bounced out of the bed. I’m a morning person, so getting up isn’t an issue for me. I love the quiet time as I write my Morning Pages. It’s the guaranteed time of the day when I can truly hear myself think. While I’m quick to rise, I’m not always so quick to settle in at my desk and write. Most days there isn’t an issue. Others, like today, are a struggle. I just felt “off.” Do you know what I mean? There’s nothing wrong, per se. I just didn’t feel in my groove, that I was a bit out of sorts, like I was spinning. In a word: I was restless. When I’m honest with myself, I know what the problem is. I’m at a crossroads with a novel I’ve been working on. After four major rewrites, it’s still mammoth at 120,000 words. I realized after the third rewrite that I could turn this into two novels. I’m struggling to figure out where to break the story. I’ve put it aside for the moment, but mentally I haven’t let it go. And that’s holding me back, making me feel like I’m not making progress. Having coffee this morning at Atlas Espresso Bar. Feeling unsettled this morning, I went for a walk and ended up having breakfast at Atlas Espresso Bar (great coffee, by the way, for those in Toronto or those who may be visiting!). When I’m out walking, and often when I run, something magical happens: Clarity. I’m an artist, and this morning I remembered the importance of taking the longer view. Each day that I show up to write moves me forward on my creative journey. Some days I might only get down two hundred words. Other days, working in two-hour segments, I might get in three to four writing sessions. Each day’s work, no matter how big or small, is a valuable contribution to the larger body of work I’m trying to create. The important thing is that I keep at it, steady as she goes. Taking the longer view, maybe I’ve been a little hard on myself and have let my inner critic have dominion over me. I have made progress — on this writing project and others. I’m working hard to blog regularly. I’m still producing my Twitter Fiction Tuesdays (#TwitFicTues) series. I am showing up to write every day and proving — to the world, and more importantly to myself — that I have grit. It really is a matter of perspective. Sometimes, weathering the storm, it’s hard to see clearly the track that has been laid, how far along I’ve actually come. That’s why we can only take life one day at a time and, as artists, show up each day to do what really excites us. Let our passion fuel us, help us to love the moment in which we find ourselves, and give our very best to our work. How is your creative journey progressing? Let me know in the comments section below. I’m a passenger on my creative journey, not the driver. 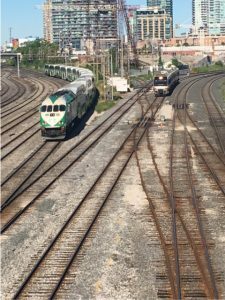 I think I always knew that, but it struck me yesterday as we sped eastward along the 401 after spending a couple of hours at the Aberfoyle Flea Market. With my gaze fixed on the rolling landscape, I thought about where I’ve been, where I am and where I still hope to go. It also had me thinking about how it all began. My first “contact,” if you will, with the arts came through music. At age six I started piano lessons, and shortly thereafter I was performing in church and in the spotlight from which I tried desperately to escape. In my early twenties, I turned away from music. Perhaps it was a way for me to affirm who I was. My parents saw it as an “act of rebellion” but I just had other ideas about my life. I didn’t see myself as a church organist, nor did I have any desire for a professional music career. Perhaps, too, I was just scared and that I had bought into the belief — preached at me by my family — that a life in music, and the arts in general, was a dead end that would only lead to a life of alcoholism and drug addictions. Did I really want to end up like that? My mother prayed that I wouldn’t! But by the time I finished my undergraduate degree in French literature, I knew that I wanted to be a writer. I poured my heart and soul into writing, and good things finally happened. My short stories, poems and essays were published. And then, after a lot of hard work and weathering the flood of rejection letters, my first novel was published. Writing began to bear fruit. When I moved to Ottawa in 1999, it was the first time in my life that I didn’t have regular access to a piano. The only times I played were when I returned to Halifax to visit family. As I pursued my writing, I felt that something was still missing. I wasn’t sure at the time what that something missing was. After a long absence, I had returned to painting yet, still, I couldn’t shake that feeling of something missing. A week after I’d started a new job in 2004, providence moved. One of my colleagues mentioned that the person whose position I had taken was looking to sell her baby grand piano to make room for the incoming grand. Without batting an eyelash, I swooped in and bought the piano. That feeling of something missing had ebbed. I was making music again. From 2005 to 2013, I bounced creatively between music, painting and writing. Some days I ended up completely lost in my writing, and that was all that I can do. Any other creative projects ground to a halt. Other days, I scrambled between my office and my painting studio to work on a new series. Then I found myself showing up at the piano not just to practice but to compose. And the music rained down on me in hard pounding sheets, and I struggled to take it all down, to let “God” or the “Universe” work through me in a new way. I’ve faced many turns on my creative path, and as a passenger, I wasn’t always certain where I’d end up. When I took a new job in early 2013, I didn’t foresee how things would change. I’ve been focused singly on my writing (my piano and painting supplies remain in storage). But something feels different. I don’t feel like I’m “missing” something. I feel like I’m where I’m supposed to be, doing what I’ve been called to do. I don’t mind being a passenger. The journey is pretty sweet. Are you on a journey, creative or otherwise? Do you see yourself as a passenger or a driver? Let me know in the comments section below. I boldly declared 2015 my Year of Selfishness. Fast forward to today, and “selfishness” is an inherent theme in my life. In a word: It’s become my modus operandi. Selfishness, as my modus operandi, is about me acknowledging what it is that I want to achieve and have the courage to go after it. It means that I must be willing to put myself first, which I’ve discovered is sometimes difficult to do. I don’t want to let down my partner, friends or family. I don’t want them to feel like I’ve abandoned them. But if I’m not being true to who I am, or if I’m not feeling like I’m moving confidently in the direction of my dreams, how can I be there for anyone else when I haven’t been there for myself? Wouldn’t that mean that I’m the one who I’ve abandoned…? Selfishness is about me committing to realizing my dreams, to achieving my greatest potential. And it’s not easy. What remains most elusive is the idea of balance. The challenge is to not let myself get caught up in the hustle and bustle of life, to resist the temptation to rush, rush, rush. I’ve never been concerned about aging, but when I turned thirty it felt like time suddenly sped up. Like I blinked and my thirties were over. Now I’m approaching my mid-forties and it feels like I’m trying to keep up, to do everything in life that I want to do. (It’s not just about writing and publishing more books, but also honing my culinary skills, learning to row and build strength, someday take tennis lessons, discover how I can help change the world for the better — be the best I can be.) So you can see, some dreams have become reality and other goals have been achieved, yet I still feel like I have to rush, rush, rush in order to get everything else done — check off the items on my growing bucket list. That temptation to rush intensifies, and I teeter on the verge of “craziness,” as other goals and dreams stall. What do I have to do to get them moving again? And is there enough time in each day to do it all? This much I know is true: I must hold fast, hold strong. I look at my to-do list for today, and I’ve tackled my top three priorities. 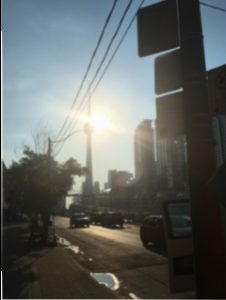 There was a question mark beside “Run,” and despite the humidity and a strong will to put it off, I ran five kilometres. I did some preparation for an upcoming training session. I also wrote next week’s installment of my Twitter Fiction Tuesdays series. Writing this blog post wasn’t on my to-do list, or even on my radar. 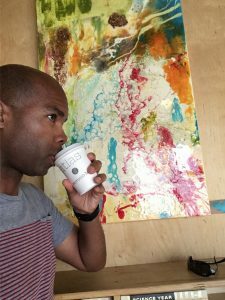 It goes to show that I have to go with the flow, and give thanks to Gregory Josephs (check out his blog) for pointing me to the WordPress Daily Prompt that got me writing in an unexpected way. The age-old adage to take life “one day at a time” is sometimes a hard pill to swallow, but I try. I do what I can in a day and try to be happy in all that I accomplish. I try (not always easy) to not chastise myself for things not done. I try, always (again, not easy) to celebrate all that I achieve. That might just be the secret to every day being better than the next, every year outdoing the previous. I am committed to the journey, which I hope will take me to a new, better and different place. After all, I have learned that balance inevitably creates a natural ebb and flow to life. I’m committed to this writing life, wherever it may lead. Are you committed to achieving your goals and life purpose? Let me know in the comments below what small step forward you took today. This post is in response to the WordPress Daily Prompt for June 23, 2017: Commit.